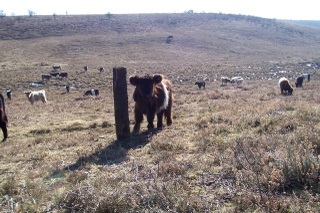 The New Forest cow comes in many shapes and sizes. A New Forest Cow may even have huge horns! The New Forest cow, grazing sedately, can come in many shapes and sizes. Usually these cows are gentle and quite shy, but if they have a calf with them, they can be quite dangerous, so please keep a good distance. There are at least a dozen breeds grazing on the New Forest National Park - you'll never see the black and white Freesian type here as they are milking cows. You'll see many calves with their mums which is a lovely sight as they are usually taken away (especially the boys) at an early stage on farms. 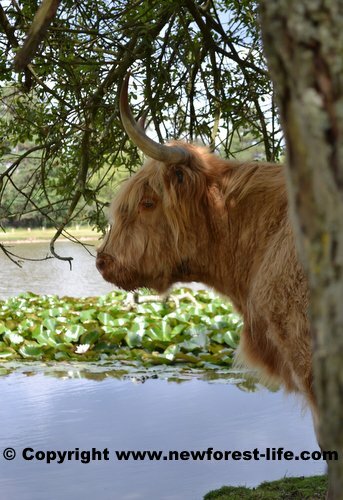 You may see highland cattle with massive long horns and very shaggy coats, especially around Brockenhurst and also Janesmoor Pond. We've seen this lovely cow many times. If it's a hot summer she likes to sedately wander into the pond and cool off! Who can blame her - although the water's a bit grotty, but not to her. There's also a cow in this area without a tail! At first it is rather a shock as it means she has lost her last few back vertebrae and so is a weird shape and probably unlikely to win many Best Cow Comps - aah, we wont tell her. A word of warning about New Forest cows and the roads. They are totally daft and have absolutely no road sense! So please be aware and give them a wide berth and slow down too please. If you are concerned about these beautiful animals safety, visit my animal accidents information page. Share your views on animal accidents - just fill in the form at the bottom of the page. Where we live on the New Forest we often get quite concerned when a herd of cows or ponies get split up from one another. One minute they are all grazing peacefully together. Then the herd of cows or ponies move on and you suddenly see - or hear - the plaintive sound from one of the cows or ponies who have been left behind. It really is quite sad sometimes, but they all manage to find each other eventually. 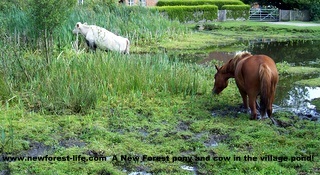 I thought you might like to share this New Forest Tale about a cow outside our cottage. They get up to lots of fascinating antics. New Forest cow being daft! One day a really funny event happened. If a strange New Forest pony, donkey, or cow is put out, the existing animals, whether ponies or donkeys or cows take a while to accept the newcomer. It really is a New Forest animal right of passage! From across the green a new young cow was crying out for the herd, which were nowhere in sight. There was a group of ponies grazing who felt they needed to put this newcomer cow in its place. All the heads of the ponies went up. The young cow had a choice - carry on through the herd of obviously curious and definitely playful/antagonistic ponies - or turn around. We were willing it to turn around as we could see there was going to be some territorial issues about to start. The young cow looked at what was ahead, decided it was going to walk through and off it went - straight through the centre. The ponies were stunned and they surrounded the youngster, some with legs flying up in the air. Some charged very close and gave a wonderful display of who was not welcome here! The young cow just carried on regardless and when it got to the far side of the green, looked round, saw his herd was nowhere in sight, and sauntered off in another direction. The ponies were stunned that all their displays of might had absolutely no effect! What an amazing sight. A cow with attitude! Never a dull minute when there are cows, deer, donkeys, and ponies about! 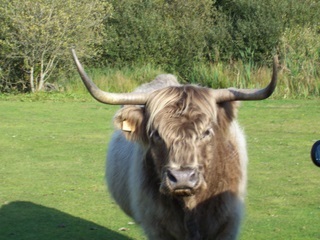 New Forest highland cow and horns! New Forest cows are probably the daftest animals on the roads within the forest. They have no idea of road danger and will literally step out infront of your car. Please always slow down and get ready to brake! There is no sorrier sight than a big dead cow on its side with an "Agister aware" sticker on it. To find out more about New Forest cattle accident figures The Verderers publish weekly accident figures. They are horribly upsetting if, like me, you love the forest animals! 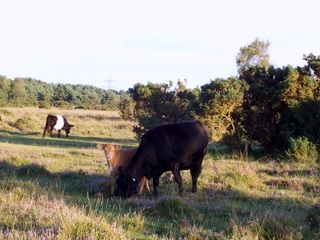 I hope when you visit the beautiful New Forest National Park you are lucky enough to see all the many breeds of New Forest cow roaming freely across the heathland with their calves too. You do have to take extra care especially when they have their calves with them. The cow is very protective of her calf and so always give them a very wide berth. I have had one lunge at me once and it is scary! I hadn't seen she had a calf and so she was out to protect it at all cost. Do you have a comment to make? Share your views on New Forest animal accidents. What are your views on the New Forest accidents each year? Share it here!